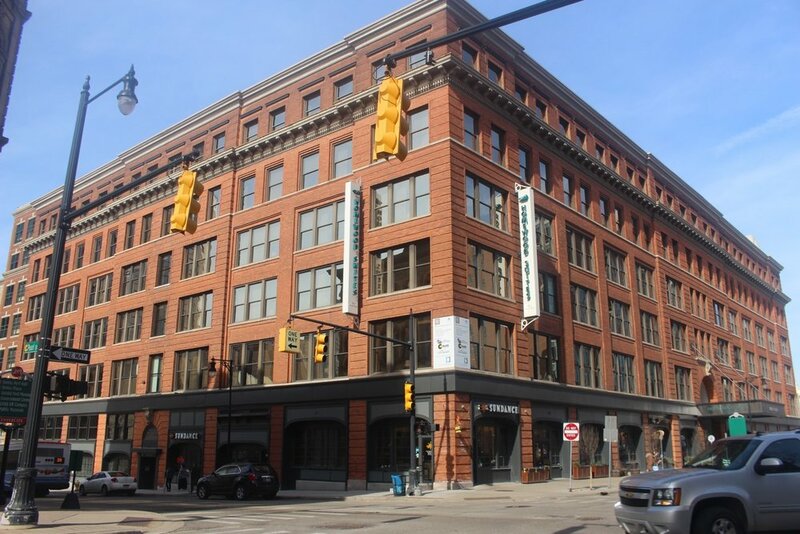 This section of Downtown Grand Rapids is home to Grand Rapids classic Beaux-Arts, Italianate, high-Victorian, and modern commercial buildings. Rood Building. Date: 1873. Design: According to the Historic District Study Committee Preliminary Report March 2011, and Grand Rapids Daily Eagle, 4-19-1873, the ornate tall and narrow Rood Building was designed as high-Victorian architecture in Tudor-Gothic style by early Grand Rapids architect William G. Robinson. The brick walls are load bearing and it has a timber-framed structure. The windows on the upper stories are flanked by pilasters and colonnades and the massive bracketed cornice. The central pediment includes the date of the building’s construction. History: The building was constructed by lawyer and businessman, Charles C. Rood, on the site of a Houseman's clothing store and Crane's ten cent museum both destroyed by fire. It was added to the National Register in 1988. Today: Flanagan's Bar and Restaurant. Water's Building. Date: 1898. Design: Built on a corner lot, this Chicago style commercial building was designed by father and son partnership, W. G. & F.S. Robinson. The 5-story building has an exterior of red brick with stone trim constructed in the new modern Chicago commercial style. Taking up the width of an entire city block, on Ottawa from Pearl to Lyon, the building was designed as one of the early furniture exhibition building for owners Dudley Waters, Anna Waters Cassard and Mabel Waters. Today: Homewood Suites and other commercial uses. Ledyard Building. Date: 1873. 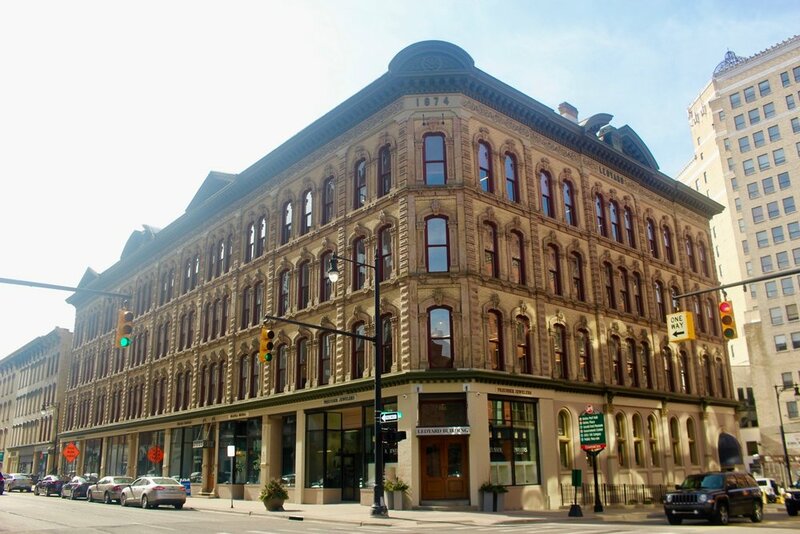 Designed: An anchor of downtown, this elaborately detailed Italianate commercial building is located at at the corner of Pearl and Ottawa although attributed by some to architect John Grady, it may actually have been designed by William G. Robinson. Today: The renovated building houses a number of commercial offices and an atrium, and was added to the National Register of Historic Buildings in 1983. Michigan Trust Building. Date: 1882. Design: The early red sandstone skyscraper, although featuring some Romanesque details including the rounded arches on the first two floors, was mainly influenced by the Chicago school of commercial architecture as interpreted by Chicago architect Solon S. Beman. According to an article in the Grand Rapids Herald, February 1, 1931, Architects Robinson & Crowe added a sun room to the clubrooms which included a lounge, cardroom, private dining rooms, kitchen and squash court, locker rooms with showers, toilets and dressing rooms. Also a rooftop garden was added on the Pearl Street side. Today: The large building towers over the intersection of Pearl and Ottawa NE, and is home to, among other commercial venues, the Ferris Coffee Shop and the business incubator Start Garden, and was added to the National Register of Historic Buildings in 1983. Federal Square Building. Date: 1893. Design: Completely renovated by architects Williamson, Crowe & Proctor in 1923. John McNabb & Sons, contractor. It is designed as a "daylight" building with a light well in the center and an abundance of windows on the exterior and hardwood floors and interior trim of mahogany. The roof was slate with copper flashings. Lighting fixtures by McBeth Monax and "linen pongee shades" completed the design. When remodeled in 1923, the top level was developed to make it a six-story building featuring 100 rooms in suites of 2 to 6 rooms accessed via,a new elevator. The lobby was on the street level. History: Original location of the YMCA. Today: Various commercial venues. Federal Building. Date: 1909. Design: This 5-story building was designed by the Federal government in the grand beaux arts style. History: In 1974, the building was added to the National Register of Historic Places. In 1981, the Post Office closed at this location and the city renovated the building which became the home of the Grand Rapids Art Museum. In 2007, the new contemporary GRAM was completed and the building was vacant once again. In 2011, the building housed temporary exhibits for the first ever Art Prize. Today: The restored LEED certified Woodbridge N. Ferris Building, is now part of the downtown campus of Kendall College of Art and Design, Ferris State University. St. Mark's Episcopal Church. Date: 1871. Design: Founded in 1836, the current church building was designed by choir member Peter Pierce who's inspiration was old Trinity Church in New York City. It was constructed in 1849 of Grand River stones hauled up Pearl Street by teams of oxen. The building evolved included the the two towers and connecting transepts. Other architects involved in changes to the building were David S. Hopkins (1871) and A. W. Rush & Sons (1893), and Christian Verheilig 1904 & 1916). Today: Continues as St. Mark's Episcopal Church.